« Frittata all gone? No!!! Makes you wanna bite it, right? What is more summer than ice cream? And for anyone who has ever had an herb garden, I suspect trimming back mint is part of that same summertime experience. So now that summer’s end is near and we are celebrating Labor Day here in the U.S., I thought I’d give you my recipe for mint ice cream. The oddest feature of this recipe is that I use both fresh mint and mint extract. 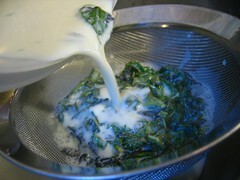 I stumbled across this experiment when I had a large bunch of cream and mint leftover from a lamb dish I was making. I thought I could combine them in an ice cream. The result was less minty than I wanted. (Wife: It tasted a little like mint tea. I had some.) 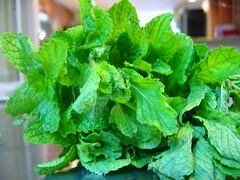 But it did have this pleasant fresh flavor, so in subsequent go-rounds I added the mint extract to give it a more robust mint flavor. This ice cream is great for many uses. You could even serve it as a small palette cleanser after a big meal. It has a real freshness to it. But two of my favorite ways are with a little chocolate syrup or chocolate ganache. 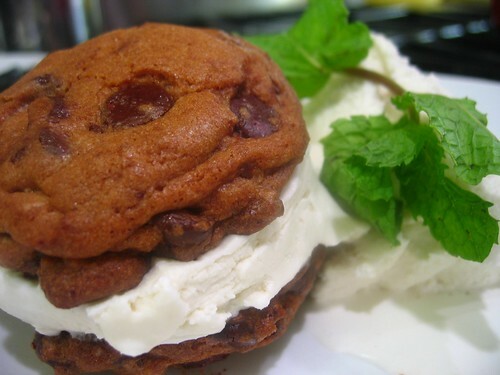 The other is shown here: as a part of a chocolate chip sandwich. 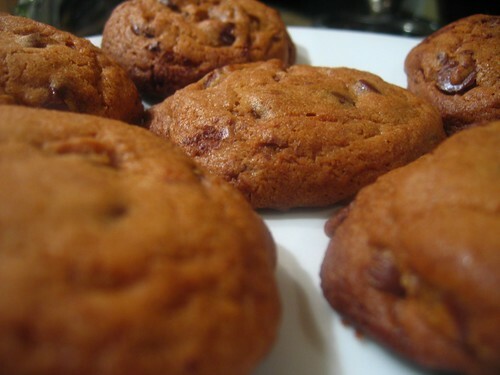 Chocolate and mint are happy companions, and with the perfect cookie everyone can be happy. Oh, and most mint ice creams’ color comes from artificial means — and I’m not opposed to that. 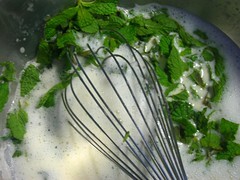 But my efforts to make the mint ice cream more consistent with what people expect — i.e. green — I was thwarted by a certain large grocery chain known for its organic goods. Seeking food coloring, I went to the appropriate aisle and found something “very natural.” When I went to pay, however, they wanted to charge me $20 for it. Since it only adds color, not flavor, I didn’t feel like paying $5 an ounce. So, you’ll have to squint very hard while wearing emerald-tinted lenses to see the green mint color. 1. 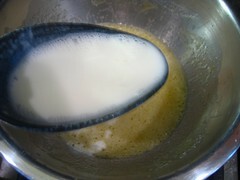 In a double boiler over medium heat, combine the milk and cream. Note: A double boiler is made when a lower pan filled with about an inch of water is used to heat a bowl placed over it. It is important because it allows for even low heating. Water boils at 212F. This means the steam in the lower pan surrounds the upper bowl where the cooking is done and the heat is low and consistent. In making custards, melting chocolate, and making ganache, the direct heat of a stovetop can be too harsh. But if you do not have a double boiler — or the set up as I have done with a metal bowl and a saucepan — you can move back and forth between direct heat and off. 2. In a separate bowl, combine the sugar and eggs. This is important because the sugar will help to keep the eggs from curdling when you add the hot liquid. 3. 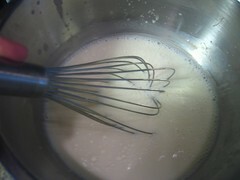 When your milk mixture reaches approximately 150F, you temper the egg-sugar mixture. Note: Tempering in this case means the gradual raising of heat. This keeps the eggs from cooking. If you were to add the eggs to the cream immediately, you’d get little pieces of scrambled eggs. Instead, to temper, add part of the hot cream a ladle-full at a time into the egg-sugar mixture until you’ve added approximately half of the mixture from the double boiler. Whisk while you add! This keeps the temperature dispersed and ensures the sugar melts. 4. Once you’ve tempered the egg-sugar mixture, pour the mixture into the bowl over the heat. 5. 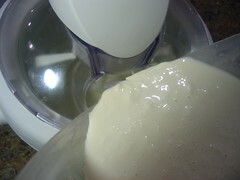 Continue to whisk until mixture reaches 160F. Note: You are making custard, so it will begin to thicken — especially against the bottom of the bowl. 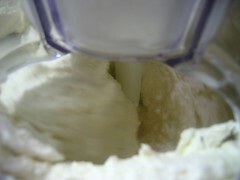 Occasionally scrape the bottom to keep the mixture underneath from over-cooking. 6. Remove from heat into another bowl. Add the mint leaves. Place in refrigerator for 1-2 hours. 7. Strain the mint leaves out. Now add the mint extract. Optional step: Return to fridge and let cool overnight. The benefit of this is that the cooler the mixture, the smoother the ice cream. Now when added to the ice cream maker it will result in an even smoother mouth texture. 8. Add the ice cream to your maker, following its directions. 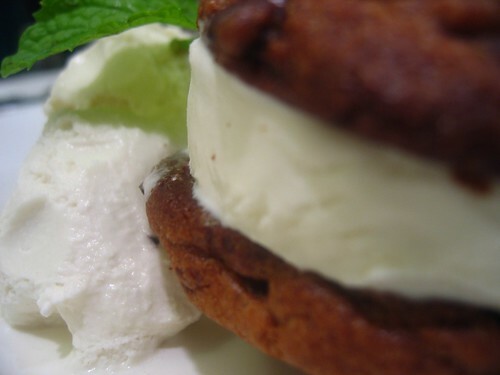 Mint ice-cream is my favourite too, thanks for the recipe! the amount of sugar for the blackberry ice cream – how much should be in this recipe? ?